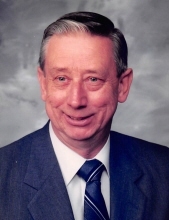 Donald John Rauch of Canton, died April 8, 2019 at the age of 87. He was born in his family’s home in the small village of Forest, Pennsylvania. Donald was the beloved husband of Shirley (nee Durham) Rauch for nearly 66 years. Donald is also survived by his two loving children Steven (Amy) Rauch of Evans, GA., and Sherri (the late Jeff) Snyder of Liberty Twp., MI., his four grandchildren Andrew, Victoria (Chris) Alexander, and Timothy and his dear sister Marlene McFarland. Donald was preceded in death by his parents Adolph and Hannah (nee Schaumann) Rauch and his brother Harold Rauch. Donald worked for many years in the skilled trades of the automotive industry and eventually retired from General Motors. When Donald wasn’t working, he enjoyed spending time in his gardens. He loved to grow food, cook food, and eat food. He also was a gifted handyman and was always fixing things through woodworking and carpentry. Donald will be greatly missed. Visitation will be Friday, April 12, from 11-1pm at the Schrader-Howell Funeral Home, 280 S. Main St., Plymouth, MI 48170. His Funeral Service will begin after the visitation at 1pm. "Email Address" would like to share the life celebration of Donald John Rauch. Click on the "link" to go to share a favorite memory or leave a condolence message for the family.